Also called a Golden Snapper in the Northern Territory, the Fingermark Bream (spotted scale sea perch – big scale red) derives its name from the distinctive “thumb print” like black spot found near its tail when just landed. This spot will fade as the fish dies as will its magnificent copper colouring. It is a splendid fish, highly prized for its eating qualities ( arguably the best eating fish to come from the estuaries) and offers a dogged hard fight to the boat. Fingermark are a member of the Lutjanus family which also include the famed Mangrove Jack and the much revered Black and Spot Tail Bass of Papua New Guinea. Impressive company indeed. Occasionally taken on lures, fingermark are best targeted with bait fishing techniques. Bottom structure is essential to hold these fish and the deeper water is preferred. Obviously this dictates fairly heavy tackle, strong leaders, sharp 3/0 – 6/0 hooks and fresh fish or large prawn baits. Either a running sinker or dropper rig is OK, the fish should be allowed to mouth the bait and take it before striking hard to set the hook in their solid bony mouth. 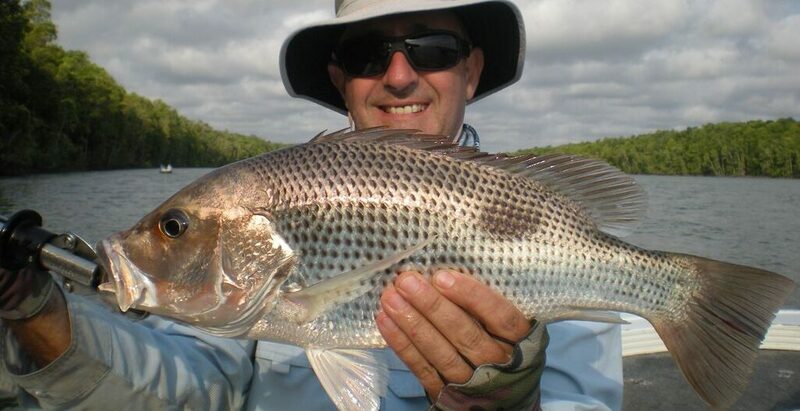 The Kings Point area out from the Cairns harbour is a renowned fingermark spot, many large fish to 10kg have been landed in this region at night using live squid baits. Other preferred locations are the deep holes within the harbour proper (Trinity Inlet) and the deep snags within the local rivers. Fingermark show exceptionally slow growth rates, take only what you need for a good feed as fish stocks can easily be put under pressure from over fishing. Size and bag limits do apply.